With a beautiful view overlooking coffee and spice plantations of Coorg, Victorian Verandez is a heritage homestay nestled in greenery. 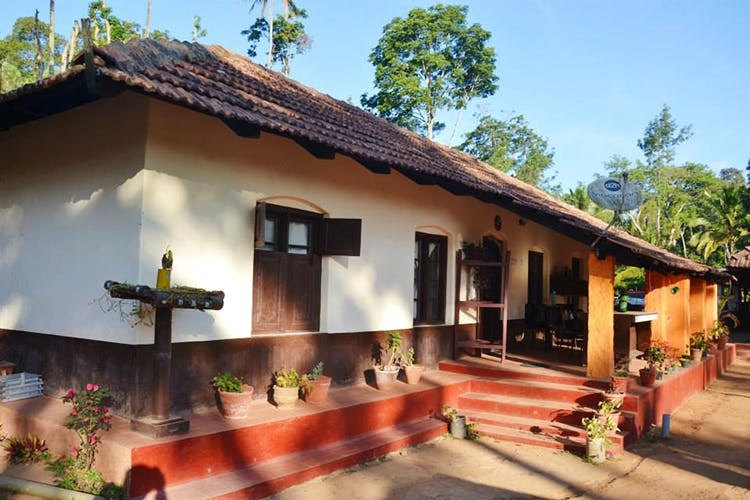 Located only 6 kms from Madikeri, this heritage homestay consist of bungalows in the Modur Estate. The plantations are primarily coffee and pepper, with huge grounds to cover. Chance upon avocado, papaya and bitter orange trees as they guide you through your trekking path. You can either book an entire cottage here or just a room, depending on the number of people travelling. We love The Rustica, a two bedroom cottage, with a living room and dining room. A 100 year old cottage made of burnt bricks and plastered mud this is perfect for bringing your own meals, as it comes with an attached kitchen. For complete privacy, stay at the Hermitage — a one bedroom cottage with a view, tucked away in the plantation.. The meals are served out in the gardens. To get a taste of colonial heritage, the biggest cottage is the Victorian Verandez which comes with 2 large bedrooms, a dining space and a long traditional corridor. The property overlooks the gardens, and is a great place to unwind. The property serves breakfast and dinner, with continental and Indian options. Depending on your stay options, you can request for meals in advance or bring your own ingredients and cook up a storm. To give you a true taste of the Coorg lifestyle, the staff will cook you the traditional pork pandi curry on request. The meal comes with fresh coffee and tea as well. Enjoy your meals in the gardens or the dining rooms, whatever you fancy — the setting maybe simple but it is a wholesome menu. The 110 acre estate offers plenty of things to do on offer — wake up to birdsong, trek to any five of their lakes and even a waterfall. Settle down for some fishing, and explore their plantations some more and take it as slow as possible. While the property does not serve alcohol, they allow you to bring your own, so plan your revelry accordingly.